Leahy, R.L. (2018) Emotional Schema Therapy: Distinctive Features. London: Routledge. Morvaridi, M., Mashhadi, A., Shamloo, Z. & Leahy, R.L. (2019). The Effectiveness of Group Emotional Schema Therapy on Emotional Regulation and Social Anxiety Symptoms. International Journal of Cognitive Therapy. Daneshmandri, S., Izadikhah, Z., Wilson, L., & Forooshani, S., (2019). Emotional Schema Therapy Improves Emotion Regulation in Individuals with a history of Child Abuse and Neglect. International Journal of Cognitive Therapy. Suh, J. Lee, H., Nahyun, Y., Min, H., Seo, D., & Choi, K., (2019). A Brief Version of the Leahy Emotional Schema Scale: A Validation Study. International Journal for Cognitive Therapy. Dr. Leahy's workshop on emotional schema therapy at the 2017 European Association of Behavioural and Cognitive Therapies conference in Ljubljana, Slovenia can be viewed here and here. Leahy, R. L. (2015). Emotional Schema Therapy. Guilford Press: New York. excerpt: "The Social Construction of Emotion"
Leahy, R. L., Tirch, D., Napolitano, L. A. (2011). 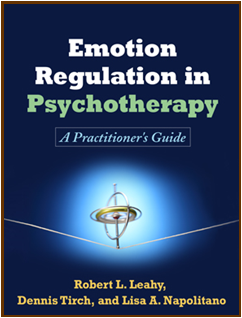 Emotion Regulation in Psychotherapy: A Practitioner's Guide. Guilford Press: New York. excerpt: "Why is Emotion Regulation Important?" Leahy, R. L. (2012). Introduction: Emotional schemas, emotion regulation, and psychopathology.International Journal of Cognitive Therapy, 5(4), 359-361. Leahy, R. L., Tirch, D. D., & Melwani, P. S. (2012). Processes underlying depression: Risk aversion, emotional schemas, and psychological flexibility.International Journal of Cognitive Therapy, 5(4), 362-379. Tirch, D. D., Leahy, R. L., Silberstein, L. R., & Melwani, P. S. (2012). Emotional schemas, psychological flexibility, and anxiety: The role of flexible response patterns to anxious arousal. International Journal of Cognitive Therapy, 5(4), 380-391. Silberstein, L., Tirch, D., Leahy, R. L., & McGinn, L. (2012). Mindfulness, psychological flexibility, and emotional schemas. International Journal of Cognitive Therapy, 5(4), 406-419. Leahy, R.L. (in press) Emotional Schema Therapy. In John Livesley, Giancarlo Dimmagio, and John Clarkin (eds.) Integrated Treatment for Personality Disorders. Guilford: New York. Leahy, R. L. (2011). Emotional Schema Therapy: A Bridge over Troubled Waters. In J. Herbert & E. Forman, Acceptance and Mindfulness in Cognitive Behavior Therapy. Leahy, R. L. (2010). Personal Schemas in the Negotiation Process: A Cognitive Therapy Approach. In M. Galluccio & F. Aquilar (Eds. ), Psychological and political strategies for peace negotiation: A cognitive approach. London: Springer. Leahy, R. L. (2010). Emotional Schemas in Treatment Resistant Anxiety. In D. Sookman & R. L. Leahy, Treatment Resistant Anxiety Disorders: Resolving Impasses to Symptom Remission (pp. 135-160). New York: Routledge. Clark, D. A., Hollifield, M., Leahy, R. L., & Beck, J. S. (2009). Theory of cognitive therapy. In G. O. Gabbard (Ed. ), Textbook of psychotherapeutic treatments (pp. 165-200). Arlington, VA: American Psychiatric Publishing. Leahy, R. L. (2009). Resistance: An Emotional Schema Therapy (EST) Approach. In G. Simos, Cognitive Behaviour Therapy: A Guide for the Practising Clinician (Vol. 2, pp. 187-204). New York: Routledge. Leahy, R. L. (2007). Emotional Schemas and Self-Help: Homework Compliance and Obsessive-Compulsive Disorder. Cognitive and Behavioral Practice, 14(3), 297-302. Leahy, R. L. (2007). Emotional Schemas and Resistance to Change in Anxiety Disorders. Cognitive and Behavioral Practice, 14, 36-45. Leahy, R. L. (2007). Schematic Mismatch in the Therapeutic Relationship: A Social-Cognitive Model. In P. Gilbert & R. L. Leahy, The Therapeutic Relationship in the Cognitive Behavioral Psychotherapies (pp. 229-254). New York: Routledge. Batmaz, S., & Özdel, K. (2015). Psychometric properties of the Turkish version of the Leahy Emotional Schema Scale-II. Anatolian Journal of Psychiatry/Anadolu Psikiyatri Dergisi, 16(1), 23-30. Batmaz, S., Kaymak, S. U., Kocbiyik, S., & Turkcapar, M. H. (2014). Metacognitions and emotional schemas: a new cognitive perspective for the distinction between unipolar and bipolar depression. Comprehensive psychiatry, 55(7), 1546-1555. Daneshmandi, S., Izadikhah, Z., Kazemi, H., & Mehrabi, H. (2014). The effectiveness of emotional schema therapy on emotional schemas of female victims of child abuse and neglect. Journal of Shahid Sadoughi University of Medical Sciences, 22(5), 1481-1494. Edwards, E. R., Micek, A., Mottarella, K., & Wupperman, P. Emotion ideology mediates effects of risk factors on alexithymia development. Journal of Rational-Emotive & Cognitive-Behavior Therapy (35)3, 1-24. Naderi, Y., Moradi, A., Hasani, J., & Noohi, S. (2015). Effectiveness of emotional schema therapy on cognitive emotion regulation strategies of combat-related post traumatic stress disorder veterans. Iranian Journal of War and Public Health, 7(3), 147-155. Rezaee, M., Ghazanfari, F., & Reazee, F. (2016). Effectiveness of emotional schema therapy on severity of depression and rumination in people with major depressive disorder. Journal of Shahid Sadoughi University of Medical Sciences and Health Services, 24(1), 41-54. Sirota, N., Moskovchenko, D., Yaltonsky, V., Kochetkov, Y., Yaltonskaya, A. (2013). Psychodiagnostics of emotional schemas: the results of transcultural adaptation and assessment of psychometric properties of Russian Version of Leahy Emotional Schema Scale II (LESS II_RUS). VM Bekhterev review of psychiatry and medical psychology, 77 (1), 66-71. Khaleghi, M., Leahy, R. L., Akbari, E., Mohammadkhani, S., Hasani, J., & Tayyebi, A. (2017). Emotional Schema Therapy for Generalized Anxiety Disorder: A Single-Subject Design. International Journal of Cognitive Therapy, 10(4), 269-282. Leahy, R. L. (2012). Leahy Emotional Schema Scale II (LESS II). Unpublished manuscript, American Institute for Cognitive Therapy. Leahy, R. L., Tirch, D. D., & Melwani, P. S. (2012). Processes underlying depression: Risk aversion, emotional schemas, and psychological flexibility. International Journal of Cognitive Therapy, 5(4), 362-379. Silberstein, L. R., Tirch, D. D., Leahy, R. L., & McGinn, L. (2012). Mindfulness, psychological flexibility and emotional schemas. International Journal of Cognitive Therapy, 5(4), 406-419. Westphal, M., Leahy, R. L., Pala, A. N., & Wupperman, P. (2016). Self-compassion and emotional invalidation mediate the effects of parental indifference on psychopathology. Psychiatry Research, 242, 186-191.